BeritaIndependent.Com | Indonesian hospitality reflected in President Joko Widodo behavior, while welcoming the very important guest form Saudi Arabia, King Salman bin Abdulaziz al-Saud, on Wednesday (1/3). It saw from the picture that had been uploaded by Cabinet Secretary, Pramono Anung on Twitter; @pramonoanung, it is clear enough that Jokowi had a good reaction when the weather begins to rain in Bogor. 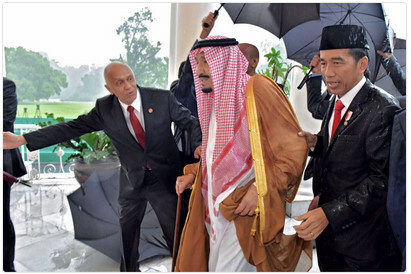 "President @jokowi’s blazer was wet because more prioritize and arm in King Salman when the cloud started to rain#Friendship ," Pramono wrote at his picture. Jokowi seemed to lead the 81-year-old King of Saudi Arabia, sought a haven immediately. His right hand held the left arm of King Salman. Because of that, Jokowi’s blazer and cap were soaking wet.